The man shot by police in Ferguson is in a "critical, unstable" condition in hospital and undergoing surgery, the local police chief said. This follows a day of commemoration events on the anniversary of Michael Brown’s tragic killing. A police officer is said to have returned shots after coming under gunfire in Ferguson close to the commemoration events. Ferguson's acting police chief also said that several people were detained during the protests, without specifying how many. Earlier reports suggested a shootout with police had left two people injured. There are also reports in social media of tear gas being fired at protesters. The shooting began while Ferguson's acting police chief, Andre Anderson, was speaking to reporters. Some 20 shoots are clearly audible on the video. 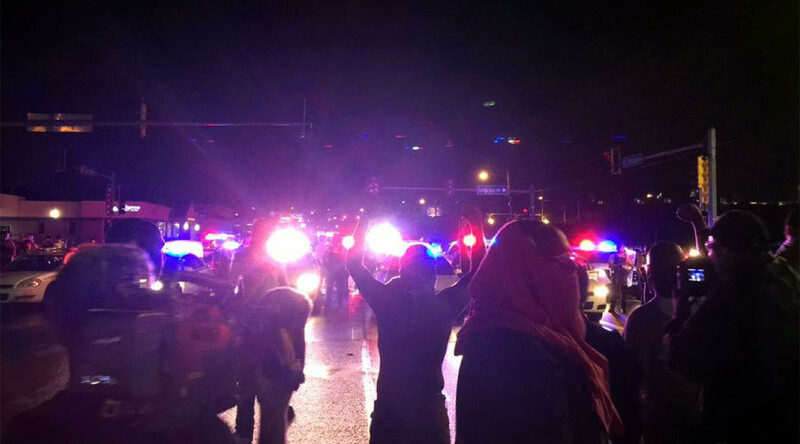 St. Louis County Police Department said that demonstrators threw objects at police and damaged some businesses in the neighborhood. Police officers are trying to restore order amid boiling tensions. A video of the suspected victim lying on the ground appeared online, showing police chasing away an activist who had been filming the incident. After gunfire was heard in the area, police again warned demonstrators who have been blocking the streets to disperse peacefully. Meanwhile, the police chief has said that authorities do not want anybody to get hurt. It was not clear where the shots had been coming from, which caused dozens of protesters to rush from the middle of the street in multiple directions to take cover. Authorities deployed additional police cars, an armored vehicle and a helicopter to the area, following the shooting incident.